Farnoosh Brock had a very successful technical career with everything that she thought that she wanted, but yet she came to understand that it really wasn’t fulfilling in the way that she wanted, and she had the wherewithal to make changes that really did work better for her. She now works with her husband in her own company called Prolific Living. the alignment of her vision of her personal contribution with that of her life partner. This entry was posted in Podcast on January 30, 2014 by Andy Gray. Andy, thanks so much for doing this amazing show – you make such a wonderful host and have a great voice. And it was such a pleasure to be on your show. THANK YOU for having me! 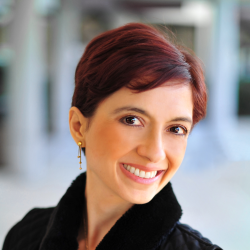 Thanks so much, Farnoosh – it was my pleasure! Thanks for the great work that you do in the world, and for taking the time to share your thoughts with the A Congruent Life community!